This is a huge crown with an inner part made of thin cow skin, with heavily embroidered surface and decorated by figures of humans and birds, also embroidered. 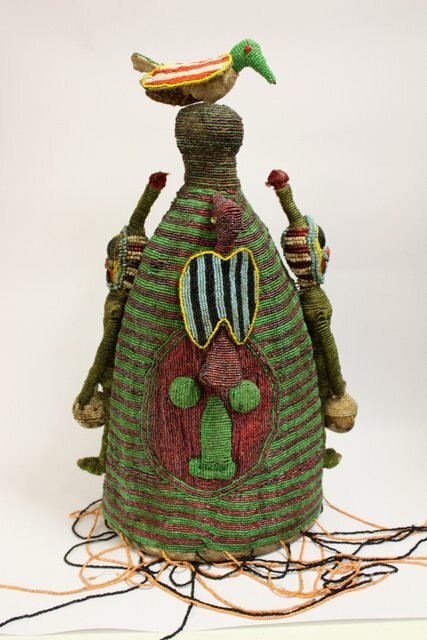 This is the famous Ade-Ileke of the Nigerian Yoruba people. Traditionally such crowns were worn by chiefs of the clan descending from legendary Oduduwa, the king who unified all Yoruba. 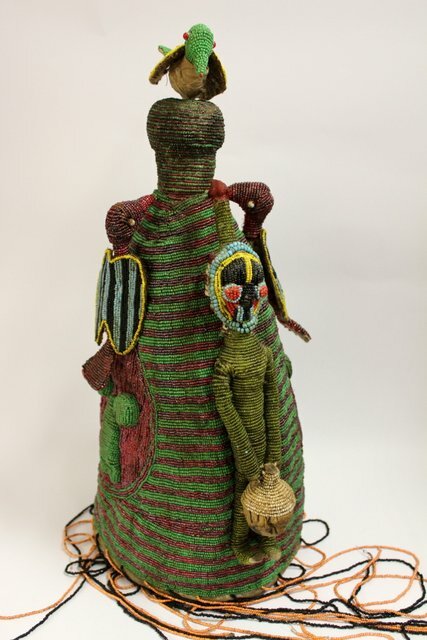 During the special ceremonies, one of female assistants from local priests puts the Ade-Ileke on the head of the chief, and then it is covered by healing herbs for protection. A veil made of dozens of embroidered ropes falling from above covers the face of the chief and attracts the attention of the audience from the personality of the king to the crown, the center of power. And the royal bird Okin sits atop this sacred treasure.